Savage Storm is the second novel of the Rys Rising series. Although I love all of my novels, I’m especially fond of this one. 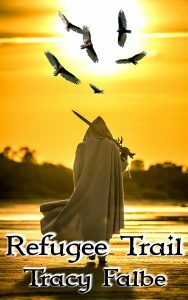 The characters introduced during the first novel really get set loose into this world of increasing conflict between two magical races, the rys and tabre. Here are six flash excerpts to help you get to know some of the main players. 1. Amar seeks an alliance with the nomadic Kelsur Tribe. Amar listened carefully to the translation, and his eyes lit up. This was progress. “Will you face my test?” Moto goaded. Amar naturally wanted to ask what the test was, but such quibbling hesitation would show weakness. Moto looked over his shoulder at the hunters seated behind him. A tall man rose like a bear out of a berry patch. The thick muscles upon his long frame looked as hard and smooth as the granite upon which he stood. “Only the spirits can help you against Bifolomo,” Moto said gleefully as his magnificent hunter moved forward. He looked like he could wrestle an elk to the ground. His eyes sparkled with wolfish intensity as he eyed the outlaw born under a roof. 2. Cruce attempts to rescue two men captured by the savages. Even without Truleo’s help, Cruce could have located the captive militiamen. The howling, singing, and chanting punctuated by the most chilling screams drew him and the tabre rapidly to the fire lit ring. Many rows of savages insulated some horrible scene. On the outer fringe the savages milled and jockeyed for position, trying to see better the ritual murder of their prisoners. Cruce and Truleo hovered in the darkness just outside the savage gathering. Nearby they could hear other men rushing to the scene, hoping to experience the gruesome sacrifice. Cruce knew that he would have to plunge into that merciless mass of bodies and do what he could. Another scream shredded his ears and amid the shouts and chants he heard screeching Nufalese curse words. “Truleo, after I go in, make a distraction,” Cruce said. The tabre was panting, but not from exertion. He was having a startling physiological reaction to the naked emotions rising from the savages and their victims. He had never imagined such horrors nor had he thought he could feel so small and weak before a group of humans. Their bloodlust exceeded those of any other animal and the power of it made him tremble. “I’m afraid,” the tabre said. Cruce’s eyes bulged. “I’m going in there now,” he said, exasperated that the tabre was afraid when he was the one rushing alone into the raving pumping heart of savagedom. More screams erupted, speaking to the worst of pains, and Truleo quailed. “Do something now!” Cruce commanded and ran into the crowd. 3. Two friends talk before grim battle. At the village smithy, they found a stone wheel with which to hone their weapons, and Rayden learned that every single arrow was already on the walls with other archers. His quiver would stay empty. “Have to do this one the hard way,” Rayden sighed and drew his sword and applied it to the sharpening stone while Cruce spun it with the foot paddle. “Thanks for saving me,” Cruce said belatedly. Rayden did not look up from his sharpening. “You don’t have to thank me, Cruce,” he said. “I didn’t mean it like that,” Cruce said, really regretting if he had caused offense. Rayden slid his sword into its scabbard. “I’m not your friend because of what you have,” he said. The sentiment touched Cruce. A trustworthy friend was a great treasure. Inspired by rowdy nights in easier times, Cruce’s sense of humor nudged his gloominess. “So you don’t want the house?” he asked. 4. Demeda sends Amar forth into battle. Amar regarded her without any patience. She knew that he had no use for any female words of caution or caring as he rushed to cross blades with the destinies of other men. Amar took her hand after she tied on the ribbon. His gauntlet was rough against her small hand, but he indulged her with a fleeting look of tenderness. “I was to be his fourth wife. I took much offense from that insult,” she explained. 5. Dacian is merciful and sends a message. The third tabre was thrown from his horse and landed at the side of the road. Dacian jumped on his back. With a knee pressing on the tabre’s spine, Dacian twisted his arms back and leaned over his head. “Tell the Grand Lumin if he visits Jingten, Dacian will extend to him the same hospitality he showed me,” Dacian said. Dacian had recognized the priest. Benar had never been especially rude, but he had been no friend either. And the tabre’s pathetic attempt at familiarity disgusted Dacian. “Dacian, help us. This is all because of the rys female, Onja. She has brought murder upon us all,” Benar blathered. Dacian shoved the tabre’s face roughly into the road. Onja wove her way among the smoking bodies of tabre and horses and joined Dacian. “He blames you for what is happening in Jingten,” Dacian informed her. “Dacian,” Benar whined as Dacian pressed his face harder. Despite his cruel mood, Dacian chose to be merciful. “You are spared, Benar. Tell your kind to stay out of the Rysamand Mountains,” he said and released the tabre. Benar popped up to his hands and knees and looked up fearfully at the two rys lording over him. 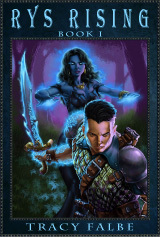 With his Nebakarz-trained sight, he saw their light blue auras flexing with unchained power. 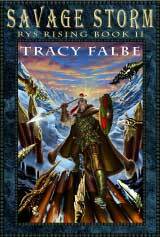 Witless with fear, the tabre sparkled with an instinctive shield spell and scrambled away. He cried out upon seeing the bodies of his brethren but he did not pause. Still screaming, he ran eastward into the night. “I wanted to kill him,” Onja complained. Dacian embraced her and kissed her hot murderous lips. “I let him go so he will infect all of the tabre with fear,” Dacian said. 6. Dacian and Onja liberate the rys. Dacian and Onja entered the tower with the rushing crowd of rys. They mounted the marble platform and entered the levitation shaft. They went first to the Nebakarz library and secured it with spells and then they checked all the private chambers of the priests and collected their journals and warding crystals. With these potentially important things in their possession, Dacian and Onja allowed the other rys to loot the tower and glut themselves on righteous destruction. It suited the new King and Queen to let their willing subjects strip the tower of furnishings and smash Nufalese décor. Dacian and Onja would remake their new stronghold to suit themselves. From the observatory, they watched the rys rushing through the tower in an ecstasy of possession. “After this night many of our rys will volunteer for such service, and we shall train them to fight,” Onja said. Visions of war paraded in Dacian’s mind. With Onja and rys warriors at his side, he would cross the frontlines of history and Nufal would shudder within its shell of civilization. If the Rys Rising series strikes you as your type of fantasy fiction, then start reading it with the free ebook Rys Rising: Book I. Through 1/1/16, you can also save 25 percent on the Savage Storm ebook. Enter coupon code 201515 at checkout to receive the discount. Code works on everything sold directly from this website, but not at other retailers. This entry was posted in Ebooks and tagged Excerpts, Rys Rising. Bookmark the permalink.